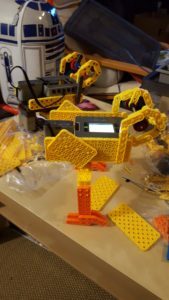 Here are pictures and videos of the VEX IQ Chickens I built some time ago for VEX Worlds. You can see the progress from the first version to the latest version with colored parts. 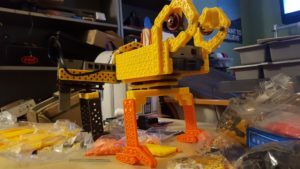 These robot chickens can each be build out of one VEX IQ kit. But if you add parts in other colors it looks more realistic. It is moving using only one motor! 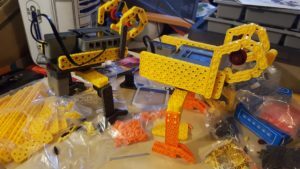 The program to make it move is really easy and a great start for robotic beginners. Dieser Eintrag wurde veröffentlicht in Development, General, Pictures, Programming, VEX IQ, Video und verschlagwortet mit Chicken, Chickens, VEX IQ von Sebastian Trella. Permanenter Link zum Eintrag. 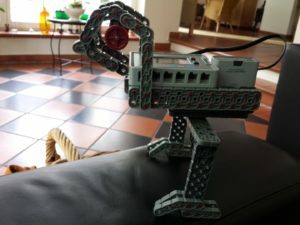 Pingback: Cool Project: VEX IQ Robot Chicken | Robomatter, Inc.